As parents, you have an important role to play in your children's education. This is the message of the newly-created Department of Basic Education. 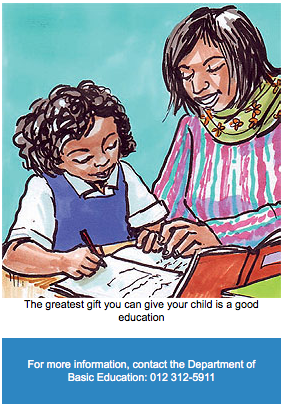 The message is aimed at encouraging parents to be more involved in their children's education. This follows the Education Department's split into two separate sections. They are the Department of Higher Education and Training, which deals with tertiary education, and the Department of Basic Education, which deals with early childhood to matric education. Government believes that education is the key in the war against poverty. The new administration has therefore made education an important priority. It will specifically pay more attention to those schools that have not been producing good results in the past. A recent study at the University of Pretoria looked at why seven young black people were able to get doctoral degrees at South African universities during the apartheid years. This was a period when black people were not supported to excel academically. The study found that behind every high performing student stood a supportive parent who valued the importance of education. The study also found that these supportive parents often did not have a good education themselves. What was common to all of them was the unshakable belief that the greatest gift they could give their children was a good education. The Ubuntu teaching that it takes a whole village to raise a child will be the department's slogan, says Basic Education Minister, Angie Motshekga. This will encourage teachers and parents to work together to ensure that learners get the education and support they deserve. Teachers will be encouraged to insist that parents check their children's homework daily and sign the homework books. They will also be encouraged to contact parents when learners are absent. Parents will be urged to co-operate with teachers and attend parents' meetings regularly. 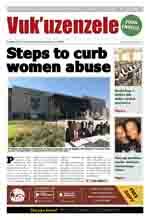 The department believes that parent involvement can also help to improve the way schools are run. This includes ensuring that the focus is on learning, that teachers and learners arrive on time and that teachers are in class every day and are well prepared for lessons. To address the problem of poor results in some township and rural schools, the department believes that parent involvement will act as an early warning system long before the learners sit for their end-of-year examinations.